LUKE WELLS’ ton has given Sussex some hope of holding out for a draw in their County Championship match with Durham at Arundel. Wells reached his first century of the season from 216 balls and has been at the crease for 276 minutes so far. He remains unbeaten on 101 at lunch, while Luke Wright is 36 not out. The pair have shared an unbroken stand of 73 to give their side some optimism going into the final two sessions of the match. Having been set an unlikely score of 514 to win yesterday, Sussex reached lunch with six wickets still intact at 223 for four. It looks as though the victory target is well beyond Sussex as they still need another 291 runs to win but they could possibly achieve a draw should they see out the rest of the day. Sussex resumed day four on 114-2, with Wells and Ed Joyce at the crease. Joyce did not last long, though, as he was dismissed for 12 when John Hastings had him caught behind. 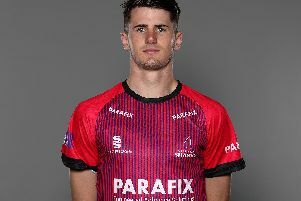 Chris Nash was the next man in for Sussex but he fell soon afterwards, chipping Graham Onions to Chris Rushworth at mid-on. Wells and Wright steadied the ship in the final hour of the session but they will need to continue their good work after lunch if Sussex are to have any hope of holding on for a draw.